Dimensions' Angel counted cross stitch ornament on plastic canvas is a Christmas favorite to stitch and share. Use for holiday trees, wreaths, swags, or even as a package tie! Finished size: 3.25 x 4. Inspired by Susan Winget's Glad Tidings Collection. © Susan Winget. This counted cross stitch kit contains: • Presorted cotton thread • 14 count plastic canvas • Needle • Easy instructions..
Classic colors, a stocking, and candy canes make Dimensions' Bear counted cross stitch ornament on plastic canvas a Christmas favorite. Use for holiday trees, wreaths, swags, or even as a package tie! Finished size: 3.25" x 4.5". Inspired by Susan Winget's Glad Tidings Collection. © Susan Winget. This counted cross stitch kit contains: • Presorted cotton thread • 14 count plastic canvas • Needle .. This cheerful snowman design is worked in counted cross stitch on plastic canvas. 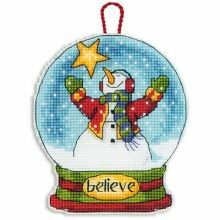 The Believe Snow Globe Ornament by Dimensions makes a delightful tree decoration or package tie. Size: 4.5 high. Designed by Joy Hall. © Joy Hall. This counted cross stitch kit contains: • Presorted cotton thread • 14 count plastic canvas • Needle • Easy to follow instructions..
Deck the halls with our elegant Bells Ornament in counted cross stitch! This exquisite design is perfect for decorating your home or creating as a gift for someone special on your list. Finished Size: 4.25" square without hanger (10 cm). Counted cross stitch kit contains presorted cotton thread, 18 count ivory Aida, felt, needle, and easy instructions. Also needed but not included: thick craft glu..
Bird On A Branch will be one of your favorites to stitch for a quick and beautiful mini. Blue Bird is sitting there on the branch with the clouds passing by wondering where his next meal is. Contains: 18-counted cotton Aida fabric, 6-strand cotton floss, frame, self- adhesive mounting board, needle, graph, instructions. Size: 2.75 oval ..
Candy Cane Dog. Counted Cross Stitch Kit Includes: 100% Cotton Aida Cloth, 100% Cotton Embroidery Floss, Frame, #24 Tapestry Needle, Fully Illustrated Chart & Instructions..
JOLLY OLE' SAINT NICHOLAS, LEND YOUR EAR THIS WAY! Our Celestial Santa listens for dancing sugarplums as well as holiday wish lists! QUICK AND EASY and learn how to cross stitch, too. This Counted Cross Stitch Beginners design is a heart- warming gift for any holiday lover. A unique WHITE KEY OVAL FRAME INCLUDED. Each kit contains 18-count White cotton Aida fabric, 6-strand cotton floss, frame, se.. Bright and cheery holiday colors are used to create our contemporary style Christmas Pals Ornaments in counted cross stitch. Finishing materials are included to transform your stitching into clever tag-shaped ornaments. Finished Size: 4 1/2" high (11cm), Set of 6. Kit contains pre-sorted cotton thread, 14 count white Aida, felt, needle, and easy instructions. Designer: Debra Jordan Bryan. © Debra .. This is on a new and unopened complete COUNTED crosstitch kit of a set of 6 Christmas Tree Ornaments or gift embellishments entitled "Christmas Sayings Ornaments." This is a cute set of 6 unique Christmas sayings on ornaments. Among the designs are Christmas saying collections and designs like Seasons Greetings, family, and friends with a red angel silhouette; Peace, Joy, and Love with snowflakes;..